The Musical Annie is an American classic that debuted on Broadway in April, 1977. Classic songs from it such as “Tomorrow” and “Hard Knock Life” of our collective pop-culture lexicon. Yet, somehow, for all this reviewer’s personal time in playhouses and movie theaters, I had never personally seen Annie, be it on-stage or the 1982 film version or the 2014 “revision film version” before witnessing Granite Theatre’s winter 2018 production in Westerly. The show is a lot of fun, and a wonderful showcase for veteran Rhode Island stage Actor Michael Thurber as Oliver Warbucks, a 1933 era billionaire tycoon who can – and does – set up personal meetings with President Franklin Delano Roosevelt, as played by the likable Rick Bagley, even though they have fundamental differing political viewpoints. Warbucks calls upon Roosevelt once it’s clear that his intention to adopt young orphan Annie (a character that was originally based on the popular Harold Gray comic strip Little Orphan Annie) is sidetracked by Annie’s sudden anxiety and wish to be reunited with her long-since departed parents. Showing true compassion for the young girl above his own ego and disappointment, Warbucks launches a campaign to find Annie’s true parents, calling upon President Roosevelt, the FBI and the cutting edge media of the time… live radio broadcasts! Warbucks even offers $50,000 as a reward to anyone who might be able to prove they are the “true parents” of Annie. Of course, that reward brings out a series of phonies, who are looking to collect the money, as reported by Warbuck’s patient assistant Grace Farrell (played with a steady hand by Ali Mitchell). I found several aspects of this show very interesting that may be taken for granted by audience members already familiar with the work. For instance, I was surprised to see a character based on President Roosevelt so prominent in the work and how Annie becomes a sort of “Forrest Gump” catalyst to Roosevelt’s New Deal initiative. So, there are a bit of U.S. History lessons for the younger members of the audience or those of us that may have forgotten these important contributions. I was also impressed that the serious anguish of orphaned and waiting to be adopted children is effectively illustrated. Indeed, even though Annie finds herself in Warbuck’s mansion, with both he and his staff catering to her every wish, her life on “easy street” is not quite the same as being reunited with the birth parents she has never met. 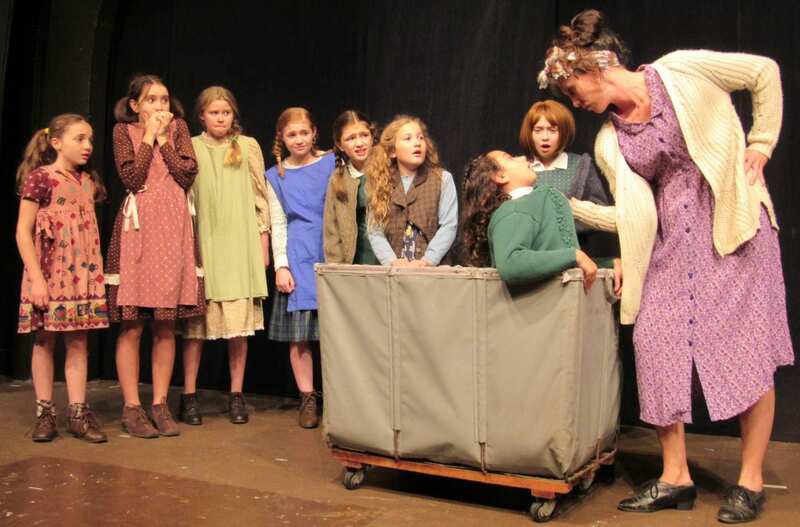 This inner conflict of the orphan is a topic that was probably not widely discussed during the 1933 setting of the play and just becoming a dinner table conversation in the liberal 1970s when the show was first produced. I was surprised to see this serious topic touched upon in the play, even if the quick turnaround of Annie’s emotional state when she finally learns what really happened to her parents was a bit emotionally unfulfilling. The stage and scope of the production was extremely high quality, this is a loaded cast, and several Granite regulars put on wonderful performances in various roles, such as Jane Mandes as the opportunistic orphanage manager Miss Hannigan, Keith Eugene Brayne as her scheming brother Rooster. Working in cahoots with Rooster’s girlfriend Lily, played with zest by Erin Sousa-Stanley, the brother and sister duo aim an old-fashioned shakedown, by having the couple used forged evidence to prove that they are indeed Annie’s parents. I did find that the costume choice of an over-sized costume mustache for Rooster during these “scheme” scenes was a bit over the top and not in conjunction with the rest of the universe of realism created up until that point in the production. Oddly, the “bonding” moments between Warbucks and Annie seem to be somewhat abridged to what I would have imagined, as we are in told through exposition in dialogue from Farrell to Hannigan how much Warbucks and Annie have been enjoying each other’s company during a “two week” trial of sorts that Warbucks has requested to host an orphan, as, more or less, a public relations act of goodwill. Surprised that orphans can also be girls, Warbucks at first is standoffish to his new guest but eventually falls in love, in a fatherly way, with Annie. As an audience, we are told but not shown that Warbucks and Annie have bonded. We see the before and after of that father-daughter type bonding, but not much of the bonding itself, except for Annie’s attention to the delightful ode to New York song that Thurber and several background singers pull off quite nicely. While the writing of the show itself can not be altered at this point, it is too bad from my perspective there is not more scenes of an Annie “melting the all-business Warbucks heart” nature. Nonetheless, we get the idea. It was also interesting that two young Actresses will be playing Annie throughout the run of the show as is the case with another orphan supporting character of Pepper, so please check the Granite website or call the box office if you happen to be counting on seeing any specific performer in action. The young cast members deliver spot-on renditions of their songs, It’s A Hard Knock Life, in particular, was certainly on point, as was most other aspects of this tremendous production, providing a feel good and worth alternative to traditional “A Christmas Carol (not again!) local theater” in New England at this time of year.